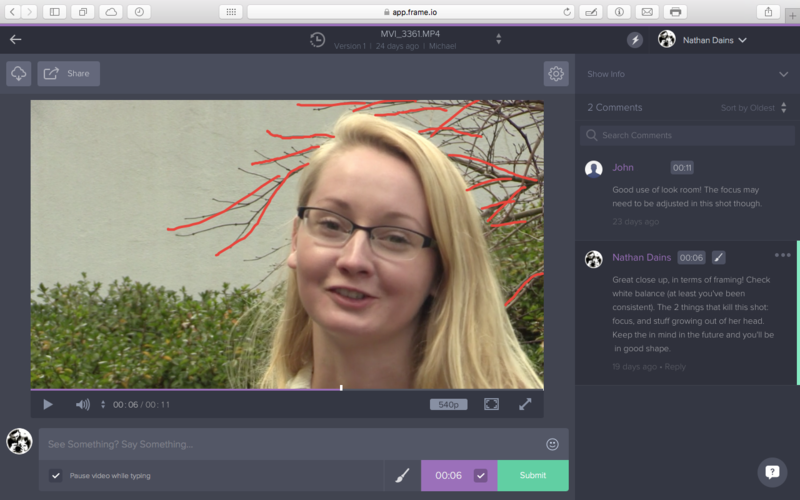 Frame.io is a web-based platform that features integration with leading video editing software. Benefits of using Frame.io include fast, simple hosting of media to be used in projects, and the ability to upload versions of projects for comparison and commentary from “collaborators,” in this case, the instructor and classmates. At the Faculty Technology Showcase on February 26, I highlighted the benefits and uses for Frame.io regarding video production courses, and discussed with others how the tools and abilities available with Frame.io may be useful in other disciplines. Developed as a collaboration tool for video production, Frame.io is a natural fit for my video production courses. On their homepage, Frame.io explains that they “replace the hodgepodge of Dropbox for file sharing, Vimeo for video review and email for communication.” These are exactly the ways I employ Frame.io for my exercises in class. Beginning with a framing and composition exercise, I use the commentary features to review video that students take of each other to exercise basic camera skills and concepts I have taught them in class. In their second exercise, students shoot coverage for a one-page dialogue scene and edit that footage together in Adobe Premiere Pro. Students create a rough cut (a draft, for the document minded) and a refined, finished edit. Students upload both versions to Frame.io and use the Version Comparison feature to see a side-by-side comparison of their different edits so they can see exactly how their refinements altered their scene and I can make comments on those edits. We will put the all the collaboration features of Frame.io to use in our class final project: creating a promotional video for the trombone and tuba studios at the University of Alabama School of Music. The class will be split into groups, each group responsible for shooting interview footage of different members of each studio. The groups will also collaborate on shooting concert footage and other various footage to use in the video. Each group will upload their footage to Frame.io, so that all the footage is shared among the different groups. Then each group will use the footage they choose in their own version of a promotional video. Students will be able to comment on each other’s work to maintain consistency and address issues that may arise. Then, as with the Dialogue Exercise, the groups will upload versions of their edits along the different stages of the editing process so they, and I, can provide timely feedback in a precise, meaningful way. These tools in Frame.io, if used properly, will provide the opportunity for the class to produce the absolute best final project they can. At the end of it all, the trombone and tuba studios will review the projects and choose which one (or which ones) they will post to their respective websites and use as recruitment tools. The Frame.io platform has obvious uses for video production courses. At the Faculty Technology Showcase, I wanted to discuss other uses and possibilities for this program, and I had the opportunity to do so, especially with faculty from the School of Nursing, who had great ideas on using it for their needs. Frame.io currently features integration with Apple Final Cut Pro X. At the showcase, I was given special permission by Frame.io to show a video highlighting new developments in integration with Adobe Premiere Pro, which is supposed to release in the near future.